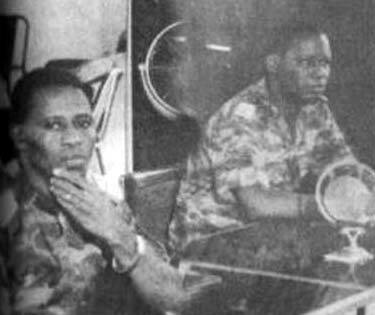 This evening in 1989, the number two and three men in Burkina Faso’s military government were seized and summarily executed for allegedly plotting a coup of their own. Henri Zongo and Jean-Baptiste Boukary Lengani certainly had the pedigree for it; they’d conspired along with Blaise Compaore in the 1983 putsch that brought Thomas Sankara to power … and then Zongo, Lengani and Compaore had overthrown Sankara four years later. On this date, a triumvirate increasingly strained by personal rivalries and economic disagreements was unilaterally dissolved. According to the official announcement, Zongo and Lengani planned to seize the airport while President Compaore was out of the country, shooting down his returning plane if necessary. Whether accurate or pretext, their elimination (along with two other conspirators) helped Compaore consolidate his hold on Burkina Faso — a country he still governs to this day.